Did you know that it is possible to rent an ATV in Bayfield from Adventure North Rentals and explore some of the most amazing ATV trails in Wisconsin? There are many different ATV trail systems available for visitors to ride when they come to visit this beautiful and scenic region. Some trails wind through state forests, while others make their way through parks, water areas and around wildlife preserves. Whether you are using one of our Polaris ATV rentals for a day, weekend or a whole week’s worth of fun, it is important to make sure that you are aware of the ATV trail rules throughout the state so you won’t get into trouble. 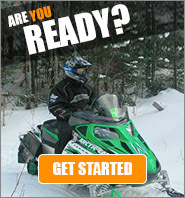 What is the Difference Between Snowmobile Trails and ATV Trails? This is a common cause for confusion, especially for visitors who are unfamiliar with the miles and miles of North Wisconsin ATV trails and snowmobile trails. In the State of Wisconsin, it is illegal to ride an ATV on a snowmobile trail unless it is specifically labelled as a “joint use” trail. These types of trails are very rare, so it is important to never assume. If you aren’t sure, speak with one of the employees when you rent an ATV in Bayfield or talk with other locals and experienced visitors who are out on the trails. Even if the snowmobile trail is a joint use trail that can be used with your Polaris ATV rentals, it can be difficult to locate and identify the trail sign. It is important to know that both types of trails, snowmobile only and joint use, are identified with a diamond-shaped sign that has an orange background. The only trails that you can use with an ATV are labelled with a brown diamond-shape sign that has a white silhouette of an ATV. What Are Some Common ATV Laws You Should Know About in Wisconsin? Some of the laws with regard to use of All Terrain Vehicles on the various North Wisconsin ATV trails are different than what you might be used to in another state. For example, a speed limit of 10 miles per hour or less is required when riding your Polaris ATV rentals within 100 feet of a an ice shack or shanty, as well as a person who is not riding a motorized vehicle. When you approach a trail that crosses a road, it is important to look for any signs that label it as a designated ATV crossing area. All of the road crossing areas for ATV trails in Wisconsin are determined by the cities, towns, villages and other local governments. While it is okay for snowmobiles to be driven along the side of a road, it is not okay in the State of Wisconsin for you to do the same when you rent an ATV in Bayfield, even in right-of-ways or ditch lines. Even in a designated crossing area, when you cross a public road, the headlights of your Polaris ATV rentals must be visible up to 200 feet and after dark, your tail lights must be visible up to 500 feet away. Make sure to ask about this when you pick up your rental to make sure that you can drive the rented ATV across public roads. While some of this may sound confusing, the staff members at Adventure North Rentals can help you sort it all out. Whether you rent an ATV in Bayfield for use in the winter months or during spring, summer or fall, there are different laws and guidelines that must be followed if you are going to explore the ATV trails in Wisconsin. Should You Follow Local ATV Trail Laws or State Level Laws? When you take advantage of all the opportunities that come with using our Polaris ATV rentals to explore the various North Wisconsin ATV trails, make sure to carefully follow and adhere to local ATV trail laws even if they are different from the state level laws. Some local cities, towns, villages and counties have different laws and they will be enforced against those who violate them while riding the ATV trails in Wisconsin. 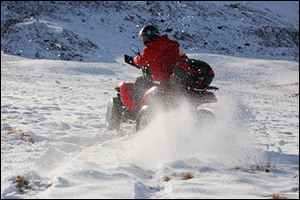 Make sure to ask about ATV safety certification courses for ATV riders under the age of 21 and speak with a representative at Adventure North Rentals to make sure that your riders meet the requirements of the Polaris ATV rentals agreement. A trail pass is required in order to ride the North Wisconsin ATV trails for vehicles that are registered outside the state. All of the automatic Polaris ATV rentals available through Adventure North Rentals are registered in-state and meet all local laws and requirements. If you have any questions at all about how to use North Wisconsin ATV trails or what it takes to rent an ATV in Bayfield, WI on your next trip to the area, please give us a call at 715-779-3150. We are happy to help you with your reservation for any of our ATV and snowmobile rentals, as well as advise you on the different events, activities and other things to see, do and explore when you visit our popular snowmobile and ATV trails in Wisconsin.